Summary: The Four Guardians of the world have gone missing. They’ve been kidnapped by some of the most diabolical fiends that ever existed. Now, four misfit kids from different parts of the world must band together to save the Guardians. Along the way, they learn to work together, as they confront and conquer their deepest fears. OK back to the show- Although there is an awesome picture of a mean looking Dragon on the cover it’s not so much about a Dragon as it is the adventure of four young teens that were given the impossible task of saving the world from utter and dismal destruction. You see this is not your everyday Fire breathing , Treasure hording,Village destroying ,Man eating Dragon. He actually seems rather tame and his main reason for being is to counsel the four guardians that supposedly are protecting the world from evil. They say those who can’t do teach and that seems so with our Dragon.It seems he lives on a deserted Island ( real or mythical) and he can’t leave it . I never did figure out why.So since he cant protect the world on his own his Guardians do it.But when the Guardians disappear and can’t be found he fears the worse.Yes the end of the world as we know it. Now I don’t know about you but if the end of the world was at hand I’m thinkin’ Call the US Navy you know maybe the 7th fleet or get the C.I.A. to get get to the bottom of it. How bout’ Seal Team Six- they do good work! Not so says the Golden Dragon, He goes in a completely different direction. Recruit one cute little Red Head young girl that thinks a bit much of herself from Jersey no less, One awkward , shy young lady from Hong Kong, add one young man from Italy who cant seem to tell the truth if his life depended on it ( and it very well might) and last but not least one boy from Japan with a guilt complex. Give them each one magical item to help them in their quest and they are ready to save the world. It’s a fun book and well put together. The author gets right into the story by introducing four young people from complete different cultures. She shortly lets us know what their family life is like and their main shortcomings and personalities. This is important later in the story because their individual quest’s are based on their own personalities and quirks.Through the magical help of the Dragon they have no problem understanding each others different languages .There are lessons to be learned here for sure. As the kids struggle to learn about each other and work together to complete their unusual quest they begin to grow and mature a little. 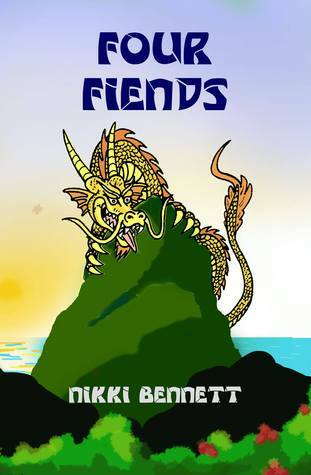 Nikki Bennett is an author and world traveler currently living in Japan. She loves traveling, and incorporates all the culture and folklore she can from the countries she visits into her stories. Terms and Conditions: NO PURCHASE NECESSARY TO ENTER OR WIN. VOID WHERE PROHIBITED BY LAW. A winner will be randomly drawn through the Rafflecopter widget and will be contacted by email within 48 hours after the giveaway ends. The winner will then have 72 hours to respond. If the winner does not respond within 72 hours, a new draw will take place for a new winner. Odds of winning will vary depending on the number of eligible entries received. This contest is in no way sponsored, endorsed or administered by, or associated with Facebook. This giveaway is sponsored by the author, Nikki Bennett and is hosted and managed by Renee from Mother Daughter Book Reviews. If you have any additional questions – feel free to send and email to Renee(at)MotherDaughterBookReviews(dot)com. Oopsies, pardon the typo! This cursive writing can be hard to read.